With the possible impeachment of the president at stake, the leading Democrat and Republican on the House Committee on Oversight and Reform clashed at the start of a hearing with President Trump’s former lawyer Michael Cohen, each attempting to put his explosive testimony in the best light for their party. Cohen has pleaded guilty to numerous charges, stemming in part from his work for Trump over a decade and from his personal financial dealings. Davis, former lawyer to President Bill Clinton, was hired by Cohen to represent him and was seated behind Cohen during Wednesday’s hearing. According to Jordan, the hearing itself was Davis’s idea. Cohen was originally supposed to testify on Feb. 8, but asked for a delay because of what he said were “threats against his family” by Trump and his associates. He is due to report to federal prison in May. Cohen testified to the Senate Intelligence Committee behind closed doors on Tuesday and is scheduled to appear before the House Intelligence Committee, also in secret, on Thursday. “They gotta find somebody, somewhere, to say something so they can try to remove the president from office,” Jordan said. 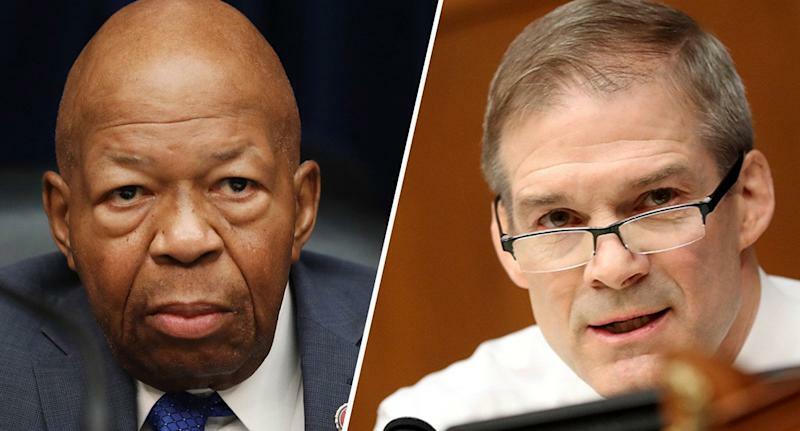 Cummings, in his opening statement, said he agreed there were legitimate questions about Cohen’s credibility as a witness, but noted that Cohen was bringing documents to back up some of his most damaging testimony. The committee began the day by voting down, on party lines, a Republican motion to delay the hearing. In a prepared opening statement to the committee, Cohen testified that Trump is a “racist,” a “con man” and a “cheat” who knew ahead of time that WikiLeaks had emails that were damaging to his rival Hillary Clinton’s presidential campaign.